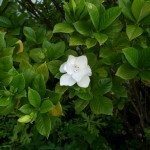 I have a gardenia for about 3 or 4 years as a houseplant. It is loosing leaves ( turning yellow ) on the lower branches, but forming buds on the tips. It has never done this before. I did spray it with insect oil when this first started happening. Any suggestions ? How often do you fertilize this? If the answer is rarely, then I would say that this is the issue. If you don't want to fertilize then you can just repot it with brand new soil.